Looks like Slashdot is finally using CSS instead of tables for their layouts. I was in the middle of reading some article, when I got "503 Service Unavailable" whenever I clicked on their links. A few minutes later, I was able to access it again and the layout looked a bit different. Checking the source, the comments are all now enclosed in divs, with no tables to be found. I read they were beta testing it a couple months ago, but I never thought I see the day when Slashdot finally dropped their table layouts. I'm still getting intermittant 503 errors, so maybe they're in the process of upgrading still. Or maybe they accidentally turned it on for a few minutes and are now rushing to turn it back off. What? The game's not on? Living in the Pacific Northwest, we don't often get to watch our beloved Cleveland Browns play on TV. This is understandable; the Browns have been a horrible football team ever since they moved back to (restarted in, rather) Cleveland a few years ago. Who, besides a Clevelander, would want to suffer through a Browns game? Occassionally, however, they'll play a team with more of a national following. Why do you opt to show an infomercial for a book that scams people with incorrect medical information (Natural Cures "They" Don't Want You To Know About by Kevin Trudeau) when there's a perfectly good football game on (Cleveland vs. Green Bay)? My wife and I are very disappointed in your choice of programming, and this reinforces our view of the declining quality of network TV. Thinking about it later, I realized that while I definitely wasn't pleased that KIRO chose to show hours of commercials instead of our football game, I was more upset that a local television station would do a disservice to the community that it serves by helping this slimeball push his snake oil. Whatever you think about a fool and his money, when a smooth-talking salesman tries to take advantage of the sick and desparate, a local television station should care enough about its community of viewers to keep stuff like this off the air. As a means of putting off more important things to do, I've set up a blog to archive the recipes my wife and I use in our kitchen at throwingfood.com. 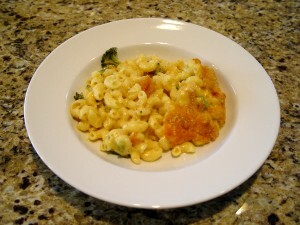 The latest entry is Baked Macaroni and Cheese (with Broccoli), as shown in the photo above. It was good. I'm not much of a handyman, but I finally got around to replacing the flakey light switch at the top of our stairs. The old one is old. I'm not sure how long it's been in there, but it looked at home with our knob-and-tube wiring that it was hooked up to, so it could have been original to our 1926 house. 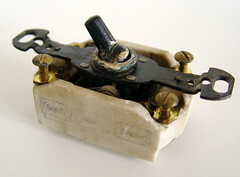 Inside, you can see the mechanical switching mechanism and on the side is a faded wiring diagram. It's housed in a heavy ceramic casing, much different than the light plastic switch that's now in the wall. It costs $250 with a 2 year contract with Cingular. It's only available through Cingular. It only holds 100 songs. It definitely doesn't have the aesthetic qualities of the iPod. It's named after a TV weatherman. With iTunes for your mobile phone, your songs live right alongside your contacts. Think of it as musical multitasking. Hear a selection of your favorite tunes while sending text messages, taking pictures or checking your email. Listen through the included headphones or out loud on the ROKR E1’s speakers. You can even pause the music when your phone rings, so you won’t miss incoming calls. I'm probably not the only one who's worried that we'll have to start listening to not only annoying ring tones but also people blasting their iTunes collection through a tiny phone speaker.